We are delighted to advise you of the Calendar of events which will grace this year’s World Hickory Golf Championship. We have signed up 4 fantastic courses in East Lothian along Scotland’s Golf Coast. They are Dunbar, Kilspindie, Gullane 2 and Gullane 3. All links courses and guaranteed to test the skills of each & every golfer in the field. We have also negotiated additional golf at a discount for other courses in East Lothian. See note below. 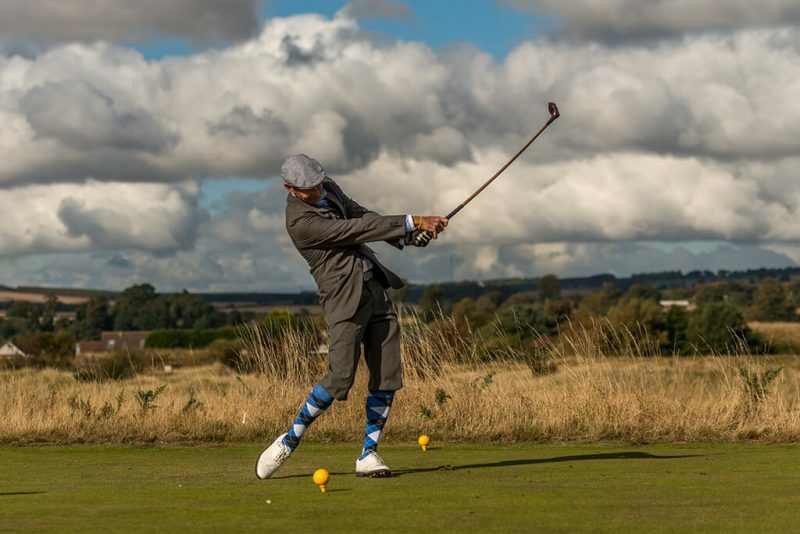 A welcome cocktail party with drinks and canapes has been arranged at Kilspindie GC, Aberlady on Sunday 20th October 2019, at 5pm. The draw for the Archie Baird International Trophy will be announced at this event. We have amended the format for this year’s Festival whereby the Opening Competition will be the Archie Baird International Trophy in the form of a Team Tournament over Dunbar GC. The format will be drawn teams of four if you are not able to indicate a four you would like to play in by prior arrangement.. Players will play as split pairs and better ball strokeplay scores, adjusted for handicap, will be collected from each pair in the four. The two better ball scores will then be added together to declare the winner with the lowest combined score. The Prizegiving for this competition will be awarded at Dunbar GC following completion of play. This year’s Open will be played over 3 rounds on Kilspindie, Gullane 2 & 3. The whole field will play over Kilspindie on Tuesday and the field will be split into two groups on Wednesday & Thursday with players rotating on each of these days. This will be an individual strokeplay event with handicap adjustments. There will be prizes for Professional and Amateur alike. On Thursday 24th October following the completion of play at Gullane GC players should make their way to Gullane GC Visitor Centre where the prizegiving will be held immediately after completion of play. Once this is completed players should make their way to Duck’s Inn , Aberlady where an End of Festival Party will be enjoyed by all concerned. Complimentary Fizz & canapes will be served from 7pm onwards. Due to light conditions and available times there will be a “cap” on the number of players in the field for each competition. In the Archie Baird it will be 100 players and in the Open it will be 120 players. Places will be allocated on a first come basis. Don’t hesitate to get the application form completed as soon as possible. Do you want to play hickory golf on Monday and Friday? 4 Person Team – 2 better ball scores to count, one from each pair. You cannot win two titles such as Runner Up Gross and Best Net. Prize order will be determined by Gross scores first. Management Team decisions are final.